In the next step of a major program to make federal government data more accessible, the US Department of Commerce convened a committee of leaders in technology to advise it on open data. The Commerce Data Advisory Council (CDAC) brings together 19 technology industry leaders from private business, academia, state and local government, and nonprofit organizations to guide the Department of Commerce in revolutionizing its data assets and creating an ecosystem around its data products. The ultimate goal is to foster innovation, create jobs, and spur better decision making. Esri president Jack Dangermond is among those selected to participate. The creation of CDAC is the next step in the Department of Commerce's effort to more robustly realize its capacity as America's data agency. 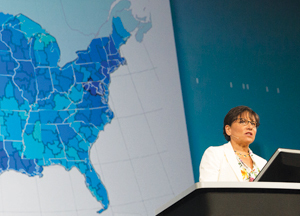 With data-heavy agencies such as the US Census Bureau and the National Oceanic and Atmospheric Administration (NOAA) under its jurisdiction, US Secretary of Commerce Penny Pritzker believes that if the department partners more wisely with the private sector—especially via a common platform—its data can make governments smarter, businesses more competitive, and citizens better informed. It may even help inject more than $3 trillion of additional value into the global economy, according to a study published by consulting firm McKinsey & Company. "The Department of Commerce has the tools necessary to develop, test, and grow the next phase of the open data revolution," said Pritzker in a speech at the 2014 Esri User Conference, where she announced her plan to hire the department's first chief data officer and subsequently convene the council. US Secretary of Commerce Penny Pritzker spoke at the 2014 Esri User Conference, where she announced her plan to convene a council of technology leaders to advise the department on open data. The US federal government and other governments around the world are increasingly embracing the open data movement, making their data freely available to other governments, agencies, university researchers, and the private sector. And they are learning from organizations that have already made headway in this realm. A number of companies in the private sector have leveraged open data to foster innovation. Zillow, the American real estate information website, not only provides detailed property information to real estate professionals and homeowners, buyers, and renters but also openly publishes real estate and rental data for anyone who wants to take a deeper look at the numbers. Commercial weather companies have historically used a range of weather data—from NOAA datasets and international forecasts to satellite imagery and surface observations—to plan shipping routes; analyze climate change; and, of course, forecast weather. The world of geospatial information, however, is just beginning to be heavily leveraged—and Esri is at the helm. ArcGIS Online, for example, gives users access to a trove of Esri- and contributor-based maps and datasets, which can be combined in myriad ways to give geographic context to any situation or issue. And with ArcGIS Open Data, a free technology for all ArcGIS Online subscribers, users can make their own data available to the public in various formats, including streaming services and multiple-format data downloads. Open Data allows organizations to build open data portals hosted on their own websites. Esri's Open Data website is also a portal where the public can search open data in a comprehensive commons environment. Already, almost 1,900 organizations worldwide have embraced Open Data, including around 250 cities and more than 200 counties, and have shared more than 26,000 open datasets. While open data is now becoming a cornerstone for Department of Commerce bureaus and offices, many of them have actually been making their data available to the public via the ArcGIS platform for years. Not only does data from NOAA and the Census Bureau infuse maps and layers in ArcGIS Online, but NOAA also leverages ArcGIS Online to access its GeoPlatform, which lets anyone browse story maps on topics such as rising sea levels, ocean economies, and how offshore minerals coalesce with coastal tourism. With CDAC aiming to make Department of Commerce data easier to find, access, use, and combine with other datasets, geospatial data will become an even more valuable form of information. Esri users will also benefit from access to additional open data sources. As Andrew Turner, Esri's chief technology officer for research and development in Washington, DC, said, "Location is a common context across all the different domains that data touches, and if we can bring Esri's perspective and geospatial focus [to CDAC], it can bring a lot of geographic context, expertise, and insight to the project."